Like many animals, cats enjoy munching on grass. Grass is a primary food source for grazing animals such as cows, goats and horses. Cats, too, seem to enjoy nibbling grass. This leaves many of us puzzled, especially since grass consumption often leads to vomiting. But feline grass gobbling is natural, and sometimes even necessary. When a well-fed cat is observed chomping leaves of grass in the backyard or inside the house, it can seem a bit odd and even unnerving. However, as Animal Planet and Pet MD point out, there are many reasons cats enjoy a bit of grass after their kibbles and chopped tuna. Grass possesses nutrients, cleansing qualities and even texture and taste that cats crave. A prime nutrient in grass is folic acid, which happens to be an important part of the feline diet, according to Kathy Blumenstock of Animal Planet. Interestingly, folic acid is one of the main nutrients present in the milk of a mother cat, and it helps with the production of oxygen in the kitten's bloodstream. As cats grow they still need folic acid, and one convenient source is grass. One common result of grass eating among felines is vomiting, which to the human observer seems both unpleasant and uncomfortable. However, grass acts as a natural stomach cleanser for cats. The feline digestive system cannot properly digest grass and other plants. So when a cat eats grass, the grass is generally regurgitated. This clears the cat's stomach of other substances that could be causing discomfort. Throwing up can bring relief. Most cats find catnip, an herb, to be the most delightful and alluring treat in the world. It is very possible that the taste and texture of grass is also appealing to cats -- a nice complement to the moist and dry cat food that we scoop into their food dishes at mealtime. It is perfectly fine to allow cats to nibble grass on occasion, according to feline information sources such as petMD and the ASPCA. However, any grass encountered and consumed by cats should be free of chemicals and pesticides. Animal Planet advises all pet owners to use fertilizers and lawn-treatment products that are pet-friendly. Additionally, it is important to watch for excess consumption of grass, which could be a sign of other problems and should be reported to your vet immediately. One sure-fire way of insuring that the grass consumed by cats is not only safe and healthy, but also eaten in moderation, is to grow your own. Catnip and cat-friendly grasses such as wheat grass or oat grass can be purchased from some pet supply shops. You can place these plants in special areas of your home or yard. This is especially good for indoor cats who would not otherwise have a chance to experience the pleasures and benefits of "grazing." Animal Planet: Why Do Cats Eat Grass? 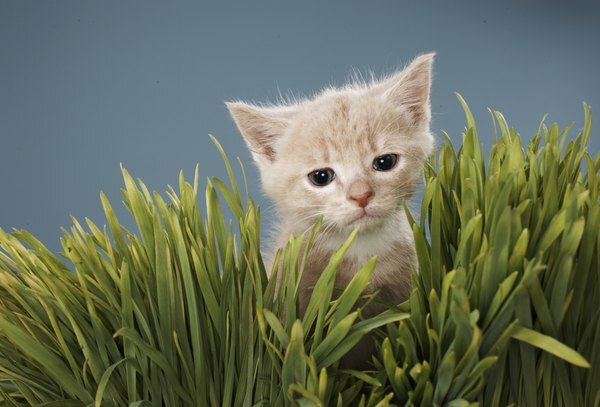 HealthGuidance: Why Do Cats Eat Grass? AAAHA Healthy Pet: Can Cats and Houseplants Just Get Along?